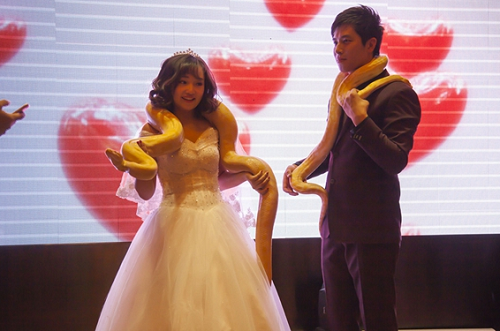 A newly-wed couple in Northeast China gave each other snakes as gifts at their wedding ceremony which held on Friday. 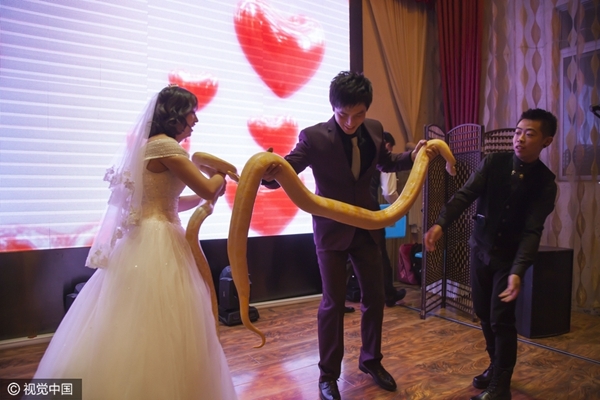 Wu Jianfeng, the groom, married Jiang Xue in Jinlin city of Jilin province. At the wedding ceremony, the bride Jiang gave a 15-kg female Burmese python/python bivittatus to the groom, who in turn gave the bride a 30-kg male Burmese python. The Burmese python is one of the five largest species of snakes in the world. It is reported that the couple are animal rights activists and bred many rare species at home, including spiders, lizards, pythons and birds.